To sing these two amazing compositions as one was conceptualised by my friend Arvind and me at a concert called Yukthi, organised by him in Madurai. Both these songs are similar in terms of where the lover asks the other to do impossible things, and refers to a very utopian place of dreams. Bhajo re bhaiyya by Oorga in our episode at Kappa TV. 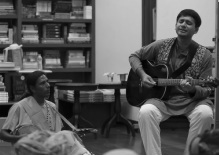 Naiharva is a song written by mystic poet Kabir that talks about longing and separation. This song has been immortalised by Pt. Kumar Gandharva. This song also features in our album Suno Bhai. This is a recording from my handheld Zoom recorder at the Fireflies festival in Bangalore. This was also the first time I sang this song accompanying myself on the banjo I I fell in love with which I picked up from a local music store Saraswathi Musicals! Ud jaayega hans akela is a poem written by Indian mystic saint poet Kabir and set to tune by the legendary Pandit Kumar Gandharva. His songs were my inspiration to get into Kabir's poetry. Pt Kumar Gandharva's tunes are really soul stirring and added to his magnificent voice, it transported me to another world altogether. This is from a concert in Mumbai at the Kabir Yatra, and I was really blessed to have Lakhon Das Baul Ji on the Do Tara performing with me. Teaching, sharing and playing music to children is one of my biggest joys! Being around children always keeps me grounded. Thanks to Anil Srinivasan, I have been able to reach out to children through Rhapsody - Education Through Music. This is the theme for a short film called Skylab Is Falling. Made by Manoj Leonel Jahson from LV Prasad Academy.